To be honest I am reluctant to see movies of physically handicapped people and it was not easy to coax myself to see this movie in which both the hero and the heroine are blind. Hrithik Roshan and Yami Gautam play a blind couple, who have gotten married recently. Hrithik gives background voice to animated movies and has the ability to speak in a range of voices and imitate several people’s voices. But Yami falls prey to the lust of Rohit Roy, brother of a local politician (played by Ronit Roy). Rohit and his sidekick violate Yami’s honour and derail the medical investigation so that no evidence is found of the violation. The police is not supportive and one of the police officers (Girish Kulkarni) is openly in league with the villains. Ronit Roy is a powerful politician and no one can touch his brother Rohit. Under these circumstances how to bring Rohit and the other violator (Rohit’s friend played by Sahidur Rehman) to get just punishment for their heinous crime? 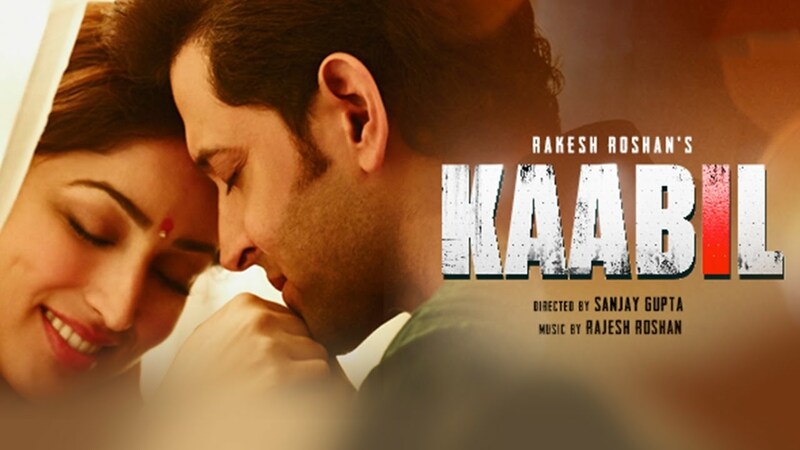 The manner in which Hrithik takes revenge on the villains by using his ability to imitate people’s voices and causing fatal misunderstandings among them is interesting to watch. The first half of the movie is not great with me feeling uncomfortable seeing the struggles of the couple to lead a normal existence in spite of being blind and then the tragedy. The second half is more gripping with some real violence and revenge saga. Poor Yami Gautam seems destined to act in roles in which she dies on screen in repeated number of films but she continues to look good. Hrithik acts decently. Ronit Roy acts well as the lawless politician and speaks in a Marathi accent as if he was born with it. Rohit Roy plays his rogue brother confidently and has built his muscles. Akhilendra Mishra is redoubtable as the father of Rohit’s friend and shows fire in his eyes. The corrupt police inspector Girish Kulkarni is actually a popular Marathi film industry actor and seems to be getting more and more negative roles in Bollywood as he already played a villain in Dangal. Music is good and some of the songs are hummable. Photography and colours are ok but nothing special. The film is worth watching due to the action scenes in the second half.